I'm on 1.13a : The only feature I've found missing is the ability to update the firmware off the SD card directly now: I tried to update to Dan's 1.14 port via the SD and M997 S0, but was unsuccessful. I talk about this experience a few pages back. That's the only 'bug' I've found so far. But yah, otherwise I'm really enjoying the firmware, especially with the 5-point bed leveling, it's like magic! Without any future FW updates, you won't miss much, right? But editing the config files on the SD-card is a drag without the ability to use Chrishamm's browser tool. The extruder builds up pressure and works for awhile, but ( at a turning point of a track?) the stepper gets pushed backwards. It's not a retraction. The stepper seems to loose torque ( gets disabled for a blink ?) and that causes the filament to grind through the extruder gears. In marlin we had a feature to disable steppers when unused ( convenient for z-axis on a Prusa ) but in RRF v1.14 I haven't seen such parameter. Is it a known bug? Maybe related to RAPS128? RRF reduces the motor currents when motors are idle instead of disabling them, to help them hold position. But RADDS doesn'the support software control of motor current. Edited 1 time(s). Last edit at 01/03/2017 03:23PM by dc42. I have just released RepRapFirmware version 1.17a. There is an untested RADDS build of it at [github.com]. Remember to follow the link and then press Raw if you want to download it. See [github.com] for the change list and important upgrade notes. i can confirm the current/official RADDS port works very well (i'm using it on a cartesian printer). I use RAPS128 @ 1/32 and 0.9 steppers. with 1/128 microstepping i had performance issues. i plan to use different drivers anyway so this is not a big deal for me. thanks @dc42 for doing the extra work! Thanks for trying it. I would expect that you should be able to use at least 64x microstepping unless you are using 0.9deg motors or trying for very high travel speeds. you are right the problems with 1/128 and 0.9 steppers where at travel speeds set to 300mm/s. the 1/32 works flawlessly for >2weeks almost continous printing (i tested the previous radds versions as well). print speed usually at 100-120mm/s and travel 300mm/s. steps/mm roughly 226. That explains it. With 128x microstepping and 0.9deg motors, if your printer has 20 tooth pulleys then your steps/mm would be 1280. At 300mm/sec that's a step pulse rate of 384kHz, which is faster than the Duet WiFi can manage. The limit is 240kHz when just one motor is moving. *David, if you decided to update the RADDS-branch frequently from now on, could you please add this method to your Wiki as "backup method #2" ? I powered up the printer and was surprised to see the steppers weren't enabled at startup. Maybe an issue with RAPS128 requiring a different R parameter in M569 P0 S1 R1? It is set to R1 in my config.g, but steppers only work after sending G28. Of course I also got heater faults and started M303 autotuning. 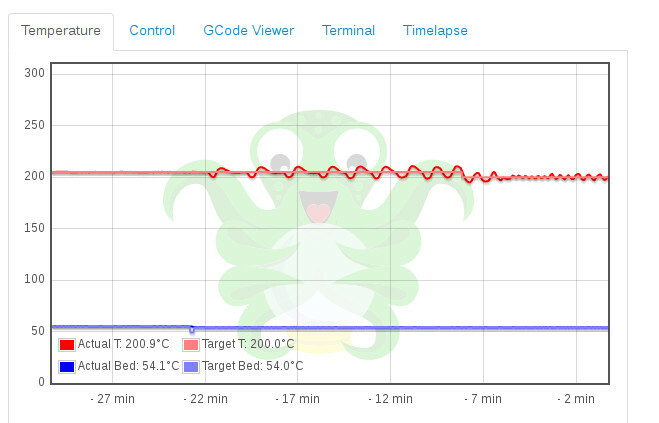 Usually, the hotend fan automatically kicks in at 50°C, but with autotuning it doesn't. Is that on purpose? Should I leave it off during tuning? Anyway, I wanted to end the tuning session with M0, but the temp climbed on. I pulled the plug and now wait until the hotend is cooled down. Edited 1 time(s). Last edit at 01/04/2017 07:54AM by o_lampe. i can't comment on autotune because my dyzendx with 500C thermistor and 60W heater did not work this way. had to find suitable values manually. if you used repetier before you might have the hotend and part fan mixed up. Edited 1 time(s). Last edit at 01/04/2017 10:55AM by xor_ea_ebx. Auto tuning turns on any thermostatic fans but leaves the print cooling fan off. This is intentional. In a future firmware version I intend to tune with the print cooling fan both on and off, so that I can implement feed-forward control when the fan speed changes. Information on RADDS doesn't really belong on the Duet3D wiki, also I am not the right person to write about RADDS because I don't use it. In the long term we may migrate the wiki to RepRapFirmware.org; but in the mean time, perhaps you should create a wiki page about using RepRapFirmware on RADDS here on reprap.org? The M106 command has evolved a lot since v1.14! I think, I better review my config.g for more improvements. ...perhaps you should create a wiki page about using RepRapFirmware on RADDS here on reprap.org? I'd love to contribute more than I do at the moment, but my technical English is so poor, it takes hours to write a few sentence here in the forum. If someone would start a wiki page, I'd love to chime in. Edited 1 time(s). Last edit at 01/05/2017 03:37AM by o_lampe. DC42, big thanks for the RADDS firmware update ! I have upgraded to it. 1/ For now, your IR sensor has 4 led blinking at startup. Before (1.14 firmware), there was only 2. Is there any difference ? What do we do with the two last lines ? 4/ is my m307 right ? Edited 1 time(s). Last edit at 01/06/2017 04:39AM by shofman. 1. Blinking 4 times is correct if you have the Z probe configured as type 1, i.e. M558 P1 in config.g. 2. Yes, although instead of entering the M307 lines in config.g, you can run M500 to save them to config-override.g. Then include M501 near the end of config.g to invoke config-override.g. 3. Ignore those last 2 lines unless you find that those computed PID parameters don't work well enough. Yes I have a M558 P1 in config.sys. I have a big bed (diam 30 cm) with lot of power (24V 15A ), so what is an acceptable delay to have a result ? The P value you use when you auto tune the bed isn't too critical as long as the temperature gets high enough. It's quite common for auto tuning the bed to take a long time, because of the long time constant. It might be a little quicker if you use P=0.8. If you go higher than that, you risk exceeding your 130C maximum temperature. We are ok that the objective is to be near from the limit (S130) if we want a good measure ? Many thanks to dc42 for this RADDS build! Warning: Heater 1 appears to be over-powered and a fire risk! If left on at full power, its temperature is predicted to reach 506C. I've tried P values down to 0.2, all of which produce the same warning (but fail to reach a reasonable temp). I don't think there's anything unusual about my hotend, which has been working fine with previous versions of RRF, except that I have insulated the heating block with kapton tape. Could that be the cause? The M307 parameters themselves are working very well. Edited 1 time(s). Last edit at 01/08/2017 02:49PM by spinor. Insulating the heater block with either Kapton tape or the E3D silicone sock increases the heater gain, hence you get the warning. Ideally you would use a 25W or 30W heater instead of 40W. I just finished a print and noticed that, despite being in a nice steady state before the print (+/- 0.1C), during the print the temperature started fluctuating +/-5C around the 205C set point. I dropped this to 200C and the fluctuations dropped to around +/-2C. I attach a shot of the Octoprint graph. It's possible that my thermistor isn't secure enough, though I didn't notice this behaviour in RRF 1.14. If the oscillations are regular, it may be that the auto tuning hasn't got the PID parameters quite right. Increasing the D parameter in the M307 command for that heater may fix that. If you prefer, you can set manual PID parameters using an M301 command after the M307. Thanks again. I tried varying D in M307 during the print without much luck. I then issued my old M301 command and the oscillations stabilised to what I'm used to seeing (+/- 1C). So for now I will override the autotune settings with the old PID parameters. Will try again once I get a 30W heater. Interestingly, the problem only started a few minutes into the print when the effector went through a series of rapid movements, at which point the temperature dropped from 205 to below 200, then up to 210, etc. At the beginning of the print (the first few layers being smooth 100% infill) the temperature was extremely stable. I suspect that my thermistor may be moving under high acceleration (it's not easy to secure), but for some reason it doesn't seem to cause much of a problem with the manual PID settings. When working properly (eg heat-up and steady operation), the autotune settings are much more stable than my old PID parameters (which tend to overshoot and oscillate more) so I hope to get it working at some point. Edited 1 time(s). Last edit at 01/09/2017 05:46AM by spinor. I've run through the autotune session too and noticed the "F"- parameter wasn't explained very well in the Wiki. I've chosen F500 because I saw it from another user. Maybe a wrong PWM frequency can get the whole planner " out off tune" as soon, as the tracks get shorter? David, what is the default PWM frequency and what are recommended values? Which F parameter are you referring to? The heater PWM frequency is 250Hz for extruders, and 10Hz for bed and chamber heaters. dc42 thank you for the update. There are a number of new features in RRF that I have been waiting for like PID autotune. Are you taking over the RADDS development for RRF going forward? No, I am not taking over RADDS development of RRF. But I will try to not make changes that break the RADDS build. The RADDS build that I publish on github are untested, unlike the Duet builds. Edited 2 time(s). Last edit at 01/16/2017 01:39PM by dc42.